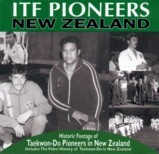 Don`t be put off by the fact that this is based around New Zealand ITF history, like the first CD it contains rare & historic footage of Taekwon-do. It is an excellant CD. The CD contains digitised footage of Taekwon-do in New Zealand by some of the pioneers of the art. Rare footage converted from 8mm film, that was taken in the early 70`s & 80`s, plus a complete video history of ITFNZ (which has universal appeal - I loved it & I`m from the UK), produced for the ITF Instructors conference in 2001. All the videos contain music & commentry soundtracks that explain the action as it happens. Part 1 includes footage of all major events in ITFNZ history beginning with early club footage, Brisbane tournament in 1981, Dawn Cotton documentary, early tournaments, telethon and the Sharp tournament in 1985. Part 2 shows the ITFNZ demo team tour in 1990, visits by General Choi, Grand Master Sereff and others, seminars and camps, television exposure, senior gradings, world champs and much more. Footage of the clubs where Mr Evan Davidson learnt his Taekwon-Do in Singapore and Malaysia. This is truly classic footage including patterns, step sparring, model sparring, sweeps and ground work and free sparring. This home movie has been digitised from old super 8 film and sound tracks added. Paul McPhail and Alan Davis (both 13 years old) fight it out Kung Fu style in the McPhail's back yard, finishing with a spectacular scene by the swimming pool. This is a great example of how training was in the 70's: fast and hard. You will see the Massey club in Palmerston North in an outdoor training session lead by Mr Michael Lowe, followed by one step sparring. In 1981 many Kiwis travelled to Brisbane see meet General Choi Hong Hi and participate in the South Pacific Championship and seminar. This shows the Master Sports Centre in Brisbane, Master Yun's famous side kick, demonstrations by the Indonesian Taekwon-Do Team and some footage of the Tournament. Great old demos by the Miramar club featuring Evan Davidson and Paul McPhail performing various patterns, sparring and breaks. Features model sparring. Choong-Jang Tul, self defence and breaking. Contains over 45 minutes of Digitized video in MPEG format.